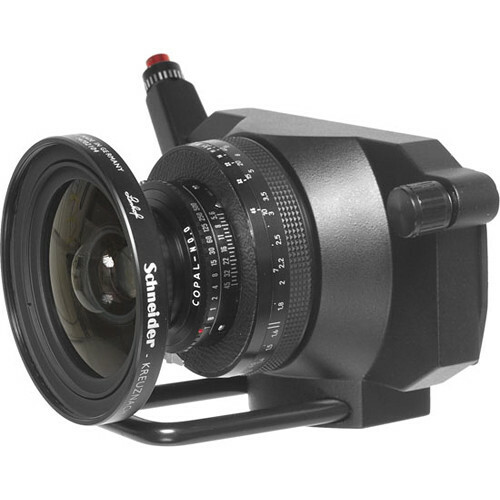 The Linhof Technorama Super-Angulon XL 90mm f/5.6 Lens Unit is a wide-angle lens, providing an 86.7° angle of view, which is specifically designed for use with the Linhof 617s III Panoramic Camera. The lens is housed within a dedicated lens unit that allows for simple attachment to the 617s III camera body and also incorporates a range of functional elements that pair well with the handheld design of the system. A helical focusing mount is integrated into the lens unit to allow for one-handed, bellows-free, focusing as close as 5.6'. The lens is set in a standard Copal #0 shutter for shutter speeds between 1/500 to 1 sec, as well as B and T settings, and has an attached cable release with soft pressure shutter release. The shutter is uncoupled from the film winding mechanism and must be cocked prior to each exposure. When in use, a corresponding accessory viewfinder can be used for precise image composition and the lens' distance scales are demarcated in imperial and metric measurements for focusing control. Compatible with Linhof Technorama 617s III Panoramic Camera. Wide-angle lens provides an 86.7° angle of view. Lens unit integrates a helical focus mount for one-handed control of focus as close as 5.6'. Copal #0 shutter provides shutter speeds from 1/500 to 1 sec. as well as B and T settings. Aperture values between f/5.6 to f/45 are available with 1/3 stop demarcated increments. Shutter has X-sync contact for flash synchronization at all shutter speeds. Soft pressure shutter release is incorporated into design to benefit handling. Dedicated viewfinder for precise compositions when lens is in use. Lens unit measures 8.7 x 5.1 x 4.9" / 221 x 130 x 124mm. Lens produced by Schneider-Kreuznach and inspected by Linhof for assured performance and quality. Box Dimensions (LxWxH) 14.0 x 12.5 x 8.0"